I only have a few Symphony concerts this fall but am really looking forward to them. I do love sitting on a stool by myself and having the freedom to sing whatever comes to mind. But there is a certain musical experience that is only possible with a larger communion of musicians like a symphony. It is an experience of rich, textured beauty; of majesty and grandeur. We need those experiences – something to draw us out of ourselves; something to take us out of the center of our own world and open us up to wonder and awe. There is so little in our culture that gives us these moments and so besides the fact that, for me, these concerts are great fun, I also think they are important. 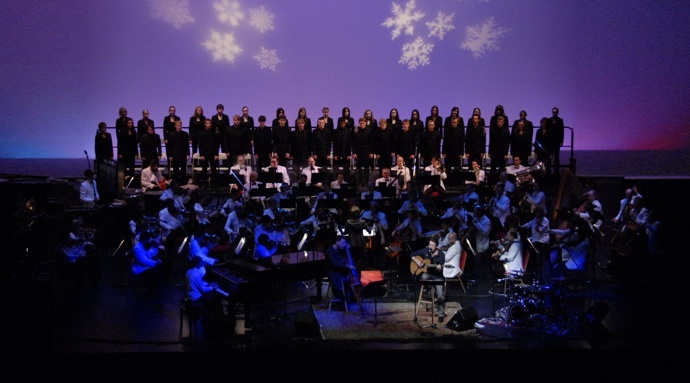 This fall I have one Christmas concert with the Kitchener/ Waterloo Symphony Orchestra on December 6. And the following weekend there are three concerts with the Saskatoon Symphony Orchestra December 10,11,12. The material we’ll be performing is partially drawn from my Christmas CD, The Feast of Seasons, but also includes the haunting In the Bleak Mid-Winter, a Hebrew gem Peace Be Unto You, and a rather energetic medley of classic holiday favourites I’ll Be Home/ Let it Snow / Sleigh Bells. Mike Janzen will be with me on the piano. Gilles Fournier on bass and Daniel Roa on drums. 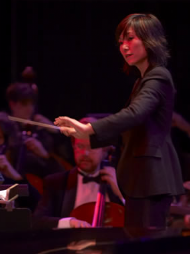 Rei Hotoda (who has conducted all my symphony concerts to date) will be with us in Kitchener but not in Saskatoon as her job as assistant conductor of the Dallas Symphony requires her to be home that weekend. Apparently Earl Stafford, conductor of the Saskatoon Symphony, is a talented bloke and we look forward to working with him there. So I hope to see good crowds at both places. If you think you want to take in one of these concerts, don’t wait too long to get tickets – they tend to go pretty quick. Currently we’re planning a new symphony concert called The Feast of Seasons – Eastertide. This concert will focus on songs revolving around the cluster of Christian feasts and seasons that make up Easter. Traditionally, the broader Easter season begins at Lent, with themes of lament and longing; moves to Palm Sunday, through Holy week, Good Friday, Easter Sunday, Pentecost Sunday, Ascension Sunday and finally ends with Trinity Sunday. Already, the Winnipeg Symphony has booked the Eastertide concert for 2011. Hopefully we’ll be able to return to Edmonton, Calgary, Thunder Bay, Ottawa with this concert as well. We still hope to arrange concerts in Vancouver and Halifax, and we are currently speaking to several US Symphonies. We may have some announcements about those in the near future. I wish that you were doing the Portage la Prairie Winnipeg Symphany again. We enjoyed it so much but I guess there are othes who haven’t enjoyed your music before.The best to you this year and Merry Christmas. I see no mention of Steve coming to Winnipeg. I thought he was coming in late November or early December??? Hey Steve, dont forget the Okanagan Symphony!!!! !